Our largest line of wines, Sheffield captures the beauty of the past and actualizes it in the present, both in the stories we tell and the wines we make. These wines celebrate the best of the Virginia wine tradition, exuding the finest of Virginia terroir. The bottles tell of heroes of the past, full of comedy and tragedy, triumph and defeat; reminding us that the drama of humanity never changes, and thus, we must drink to it! Who is Herleve? Imagine you are in Falaise Castle in Northern France in the early 11th century. There, in a bed chamber, a young girl is tormented by a strange dream. An enormous tree bursts out from the depths of her belly. Its branches spread and grow across the sea to England. The girl’s name is Herleve, the daughter of the town embalmer, and something was indeed growing inside her. She had been seduced by Robert I “the Magnificent” Duke of Normandy. She conceived a son. He will be known as William. Later, he would earn the title by which history would know him – William the Conqueror, Duke of Normandy and then King of England! Herleve and Robert would also conceive a daughter, named Adeliza (see our semi-sweet white wine), Countess of Aumale (later Albemarle), who would become wife of Odo (see our signature red blends), Count of Champagne, Earl of Aumale. Their grandson will be Stephen Le Gros (our Estate Merlot bears his name), the first ancestor of the Grace family to carry the Norman version of the name that carries forth there to this day. The first Baron of Courtstown, in 1283 William made the final exchange of Sodbury for Tullaroan and other lands in Ireland with the Welond family. He founded and endowed the monastery of Tullaroan, near his Castle of Courtstown. He was witness to the charter of the town of Ross to Roger Bigott, Earl of Norfolk, and was Governor of the county palatine of Carlow in 1268 and 1275. He built Castle Grace near Tullow in that county. In 1279, he was Sheriff of Tipperary. He married Mary, daughter of Donell Oge MacMorough, also known as Kavanagh, Prince of Leinster. The signature grape of Virginia, Viognier can be often oaked or stainless steel aged. With our Estate Viognier, we do a combination of the two. This blending of styles yields a very well-balanced wine. The 2016 Viognier exudes the classic Viognier nose – pear, green apple, honeysuckle, jasmine, and fresh cut grass. The palate brings forth more peach and a hint of warm spice on the finish. We always follow the Old World, Burgundian-style with our Chardonnay; a balance of fruity and savory notes. This aromatic wine harkens to apple pie straight from the oven. The palate begins with a bit of acid that maintains a banana note before transitioning into a warming sage butter finish. 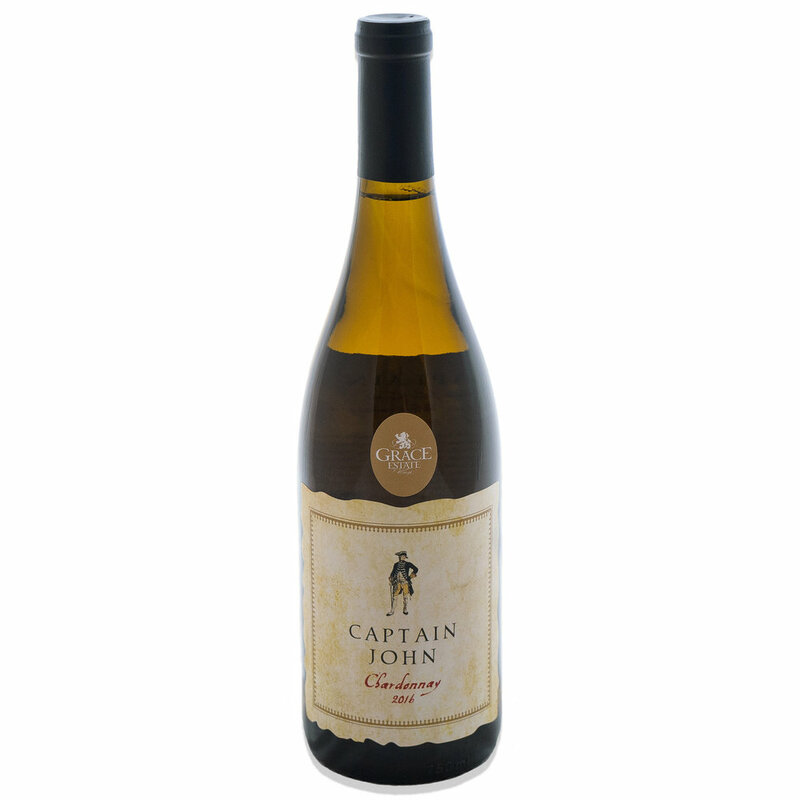 Our "Captain John" Chardonnay is named after Captain John Dowell Grace (1734-1811), who resided on the family estate in County Roscommon, Ireland. He served many years in the Austrian Army, as he was among the many Jacobites who went to continental Europe to serve in foreign Catholic armies following their defeat against the Protestant forces in the Williamite War (1688-1691). He attained the rank of captain in the Wurttemberg Dragoons and was known as a brave, humane, and generous solider. While in the service of the Austrian Emperor, he had the honor of being chosen one of the Guard to attend Marie Antoinette from Vienna to Paris on her marriage with Louis XVI, and the even higher honor of guarding Her Majesty's door at night during the journey to France. On her journey, Marie was escorted with 57 carriages, 117 footmen, and 376 horses. Captain Grace retired from the military and returned to Ireland at the special desire of his father to fulfill the duties of a country gentleman. He than became the first Roman Catholic to be called to the grand jury of County Roscommon, and he was also appointed a magistrate and deputy governor of the county. Educated at Doway College, Captain Grace was also a profound classical scholar and could speak nine languages with fluency. He died April 25, 1811 and was succeeded by his only son, Oliver John Dowell Grace, Esq. of Mantua House. The most head-turning Petit Manseng you’ll ever have! A high-acid white variety growing in popularity here in Virginia, Petit Manseng is often intensely lemony. To balance this characteristic, we age ours in Cognac barrels. Therefore, what begins with a prominent citrus acid gives way to caramel and smoke on the finish. 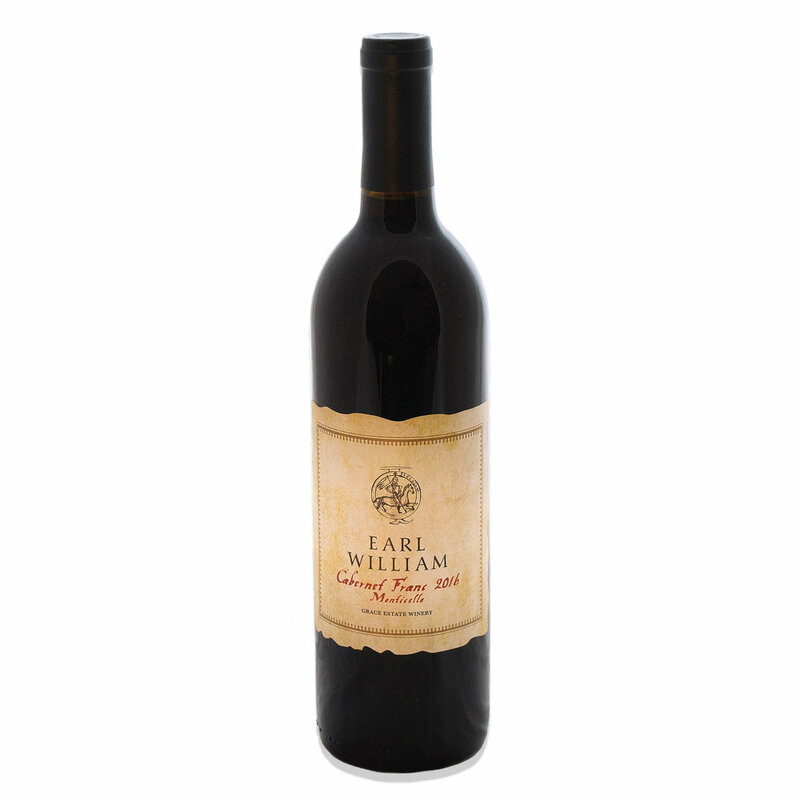 From vines more than 20-years old, this medium-bodied Merlot features a full nose of dark red fruit and fresh earth. Plum, blackberry, and smoke dominate the palate with a persistent finish. Best with grilled pork tenderloin, venison, or cheeseburgers! Count Stephen (1070-1127), Count of Aumale (later Albemarle), was the son of Odo, Count of Champagne (after whom our signature Odo red blends are named), and Adeliza of Normandy (after whom our semi-sweet white wine is named), sister of William the Conqueror. Stephen was the first cousin of William Rufus, King of England, and Robert Curthose, Duke of Normandy. He would marry Hawise, daughter of Ralph de Mortimer, Lord of Wigmore and Seigneur de St. Victor-en-Caux, and his wife, Melisende. Stephen and Hawise would have four children. Stephen was the first direct ancestor of the Grace family to carry the Norman version of the family name, which carries forth there to this day. Stephen succeeded his mother as Count of Aumale before 1089. In the conspiracy of 1095 against William Rufus, the object of the rebels was to place Stephen on the English throne! The rebellion failed, but Stephen was not put on trial as he may have been out of the king’s reach back in Normandy. Odo of Champagne, Stephen’s father, lost his English lands, however, for his suspected complicity. In 1096, Stephen took up the cross and joined the First Crusade with Robert Curthose, Duke of Normandy. On his journey to the Holy Land as Joint Commander of the Third Division of Norman Crusaders, the outfit passed through eastern France, Switzerland, all the way through Italy, and across the Mediterranean to Antioch (in present-day Turkey), where they fought. Returning home after falling short of their ultimate goal, Stephen was given back his father’s English lands after the death of King William Rufus. He thus became Lord of Holderness, Yorkshire, England. He sided with King Henry I in 1104 against Robert Curthose’s attempted coup. However, in 1118 he supported William Clito’s rebellion against Henry I, unsuccessfully. He went on the Second Crusade, where he would fall in battle in the Holy Land. In 2016, we aimed to make a slightly lighter Cabernet Franc than previous vintages. The nose has those classic Cabernet Franc elements of cherry, rosemary, and deciduous forest. On the palate, a juicy pop of acidity reverberates blackberry and rhubarb flavors on the tongue. There's just a hint of that Cabernet Franc white pepper on the finish, but successfully not overwhelming. William Le Gros (1115-1179), meaning ‘the fat,’ was the first Earl of Albemarle (Anglicized from the previous ‘Aumale’) in addition to being the Earl of York and Lord of Holderness. He was the eldest son of Stephen, Count of Aumale (see our Count Stephen Estate Merlot). It is from William Le Gros and his brother Stephen Le Gros that the Grace Family takes its name. Over the next three centuries, the family name would change from Le Gros to Crassus, Le Gras, Gras, then, finally, Grace. William was one of the most powerful earls in England during the reign of King Stephen, which lasted from 1135-1154. William founded the town of Chipping Sodbury in South Gloucestershire, England. He also founded the Abbey of Meaux in Yorkshire. He proved his valor by winning a victory against King David of Scotland at the Battle of the Standard in 1138, after which he was made Earl of York as his reward. William also built the original structure of the famous Scarborough Castle in Yorkshire. After King Stephen’s death, Henry II confiscated Scarborough Castle as a part of his consolidation of power over the kingdom. William died without a male heir. It instead passed to his daughter, Hawise. She married twice, first to William de Mandeville, 3rd Earl of Essex, then William de Forz, to whom the Earldom of Albemarle and the Lordship of Holderness passed. We’re proud to be one of the few that grow Tannat in Virginia! If you like inky and earthy, this wine is for you. Aromas of old leather and dried plum warm the nose. The palate begins with a slight acidity, and transitions to dried blueberry, graphite, and earth. Medium-to-heavy tannin, this “red meat” wine is best through 2024. The 2016 Le Gras Baril is a blend of 60% Merlot, 23% Petit Verdot, and 17% Tannat. A sophisticated but approachable red wine, the 2016 Le Gras Baril shows notes of thyme, sage, raspberry, and a hint of pepper on the nose. The palate has a graphite minerality. Hints of cherry, herb, and smoke sustain throughout with present but subtle tannin. Pair with grilled pork tenderloin, rack of lamb, or ribs. Named “Bearded” after Oliver Gras. Oliver was the Baron of Courtstown. He was an adherent of the cause of Lancaster in the Wars of the Roses (1455-1487), a conflict between cousins over who would be King of England. In 1470, Oliver was made superintendent of County Kilkenny in Ireland. He married Ellen, daughter of Anthony O’More, Prince of the territory of Leix. Best known for his dauntless spirit and inflexible justice, he gained the admiration and attachment of the native Irish. They lovingly called him “my Feasig” (the Bearded). Oliver tragically drowned in the lake near the family’s Inchmore Castle.